Free Copy of Money Metals Insider Available NOW! 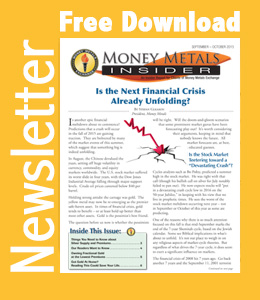 Download Your Free Copy of Money Metals Insider NOW! Money Metals is pleased today to grant you access to the September/October issue of Money Metals Insider – a FREE benefit for you, our valued reader. Please check it out right away. It's jam-packed with some product announcements, commentary on the markets, and important updates about threats to your physical safety, financial privacy, and freedom. Gold is still readily available, but low prices and extraordinary retail demand for physical silver have led to substantial production bottlenecks for coins, rounds, and bars in recent months. Meanwhile, a convergence of major economic events and market cycles have sparked global market volatility and concerns of a renewed financial crisis. Is the Next Financial Crisis Already Unfolding?